Books and prints will be available for sale during the reception. The exhibition will present selected dioramas from my children’s books trilogy: You Are Stardust, Wild Ideas – Let Nature Inspire Your Thinking, and You Are Never Alone. All these books focus on the message of how we are all connected to the natural world. Specializing in fine sketching and painting techniques, I carefully arranged the painted and texturized paper cutouts to create three-dimensional dioramas. Each diorama contains two to three spreads from the books, yet all of these different scenes come together as one body of artwork. Sheridan College’s Illustration Program students, working in 16 small groups in their 3rd Year Illustrative Painting Explorations course, curated and developed the exhibition themes and artwork for this collection of small group exhibitions. 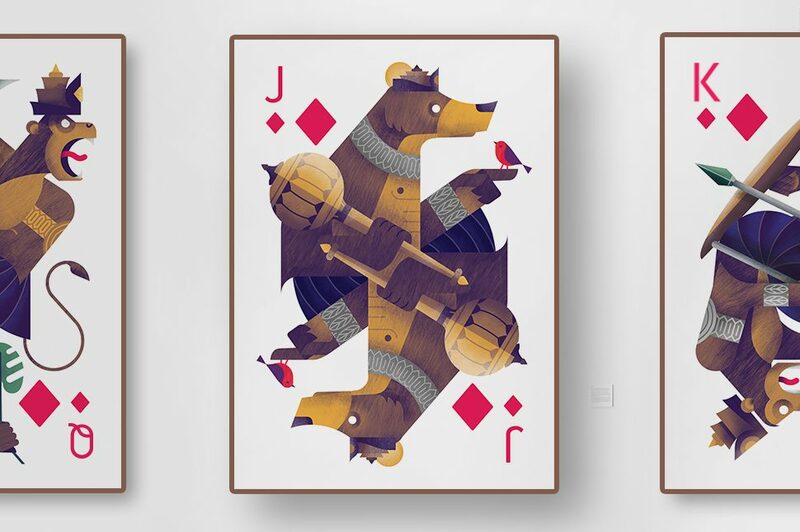 OCADU’s Illustration Program students, working in 20 small groups in their 4th Year Illustrative Painting course, curated and developed the exhibition themes and artwork for this collection of group exhibitions. Informal artist reception March 22, 7 – 9pm in the 2nd and 3rd Floor Hallway Galleries. Curated by Neven Lochhead and presented in partnership with SAW Video Media Art Centre, Ottawa. Featuring work by naakita feldman-kiss, Ivanie Aubin-Malo, Henry Andersen, Mara Eagle, Phil Rose, Molly Teitelbaum, Anna Queen,and The Video in the Public Sphere Working Group. In partnership with SAW Video Media Art Centre (Ottawa), Critical Distance is pleased to present ​Public Syntax, ​an exhibition that highlights the distinct time-based practices and approaches of seven artists, as well as those participating in the Video in the Public Sphere Working Group, the majority of whom are either Ottawa-based or connected. Situated in-gallery at Critical Distance and across multiple public spaces at Artscape Youngplace, the works in the exhibition embody and expand upon the recent and ongoing programming initiatives of SAW Video and their Knot Project Space​, ​launched in early 2018​. Responding to Critical Distance’s mandate to advance curatorial inquiry and encourage collaborative frameworks, exhibition curator Neven Lochhead employs a conversational mode to form ‘syntactical’ relations between these various practices, identifying collective editing processes where the ‘sequence’ becomes a vector on which to group together. In the gallery and public spaces, artists in this exhibition generate affinities not through the question of ​where will we meet,​ but rather ​when will we occur? 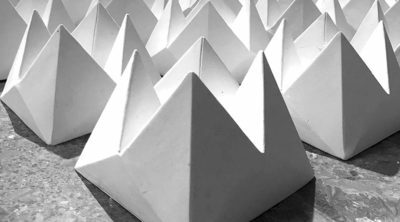 photo by Ghazaleh Avarzamani, Fortuneteller (installation detail), moulded USG hydrocal, 2016. Ghazaleh Avarzamani’s artistic practice encompasses a variety of artistic forms, including textiles, embroidery, sculpture and installation. 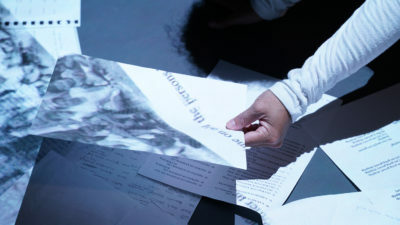 Driven by research on manifestations of global powers, their impact on and manipulation of history, geography and knowledge, her work explores the ways in which diverse contexts and systems transform ideas and forms, generating new meaning. Never Never Land, Avarzamani’s first solo exhibition in Canada, expands on a recent body of work that examines the relationship between experience-based knowledge, memory construction, modern rationality and traditional beliefs. 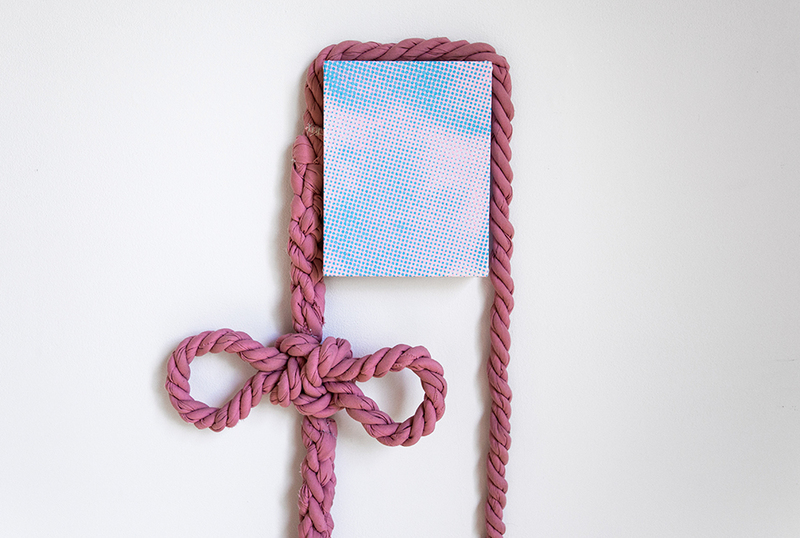 Considering a range of spaces and devices for interactivity and play, her game-based installations, drawings, sculptures and fibre works question the rules and methodologies used to educate and shape the players’ existential outlook. Game of Goose positions board games as master plans. Based on the oldest existing printed game sheet, the monumental mural piece comprises a 63-space track that maps medieval spiritualist values and superstitions, intending to instruct the player on matters of moral, social and religious import. Complicating the reading of the game, the entire map is embroidered onto a grid of 180 dark blue kisseh (Middle Eastern washcloth/loofa) and reproduced as a blueprint for the architecture of modern games. Used as support, the washcloths are quietly undermining the reality of the game itself. As objects meant to clean and remove, the blue loofas remind the viewer that no structures of power are eternally stable. Further exploring these ideas in new works created for the exhibition, Avarzamani aims to expose the paradoxical realities behind the surface of society and its traditions, educational methodologies and cultural utopias. skinwork is a striking exposition of the female form with the ambition of raising awareness for skin cancer prevention. The project was initiated by Heather Mundle and Bettina Bogar in mid-2018 just before Heather tragically lost her life to metastatic melanoma, an all-too-common form of skin cancer. Heather’s passing shifted the focus of the project to become more than a simple photoshoot – skinwork is now an awareness movement in her honour. Featuring more than 60 Canadian women, skinwork is a two-week-long photo exhibition. It will launch on March 5th, 2019 with a special event on International Women’s Day (March 8th, 2019). The exhibition will be open to the public until March 16th. Edge: Youth Art Show is open to all Secondary School Students (grades 9-12) in TDSB & TCDSB schools and agencies across Toronto. It is a free 7-day exhibition of student artwork. It is non juried with over 100 high school students & youth from approximately 20 schools across the City of Toronto participating in the program each year. It’s a great opportunity for youth to experience exhibiting in an art gallery, and connect with working artists and arts communities. Would you dare to face your mortality? Would you dare to lie in a coffin? 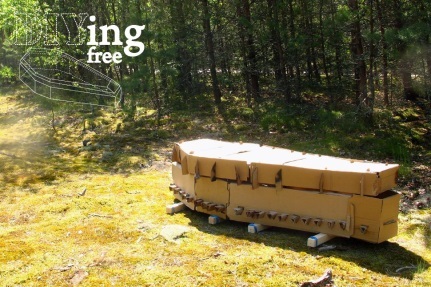 A do-it-yourself cardboard coffin seeks to turn death into a sustainable enterprise through design, technology, and open source methods, while daring you to get comfortable with the uncomfortable. Come on in and stay a while, for this is a unique chance for the living to get cozy with one of life’s certainties…death. #coffinselfies allowed, (dare I say encouraged). In 2008 in the US alone, 1.8 million bodies were buried in coffins that resulted in the approximate disposal of 1,632,932 kilograms of material, not including the energy used in the processing of the materials for those coffins, such as shipping, labor, manufacturing, finishing, et cetera. In this speculative piece we ask: Can we promote a process of death which uses design, recycled materials, and technology for a more ecological practice of grieving? We can’t stop from dying but we can die smarter and more ecological – we can D-I-Y. Grim or enlightening? Curious or distasteful? You make your call at this quirky installation that is part of the multi-site Death and Dying installation series. The ‘Death and Dying’ series explores the theme of end of life through the lens of design and art. Through participatory and observational experiences, the Series invites you to think about your relationship with death and dying as an individual, a member of a family and social network and as a human being in society. The ‘Death and Dying’ series is a collaboration between OCAD University’s Design for Health graduate program and TABOO Health. Timelines is a series of poetic narratives that connect the past with the present. Using an extensive collection of objects I have accumulated over a lifetime, each installation attempts to create a visual testimony to the power of memory. Timelines re-imagines the aesthetic association that first brought these objects to my attention, references former bodies of work and re-purposes materials I no longer use or need. Each installation builds on the ideas of preceding installations and are primarily site specific. 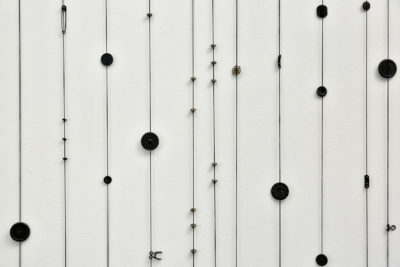 Each work in Timelines is suspended on elastic cord and embedded with found and bought objects to create a metaphorical “time line”. The objects become “mark making” tools. Knots, the irregular bumps in the cord, refer to the Quipu, knotted strings used by the Incas to keep records of information related to their daily life. The time lines are ephemeral like the illusory shadows that suggest a third dimension in space. Timelines is also an exploration of divesting; an entangled, cumbersome undertaking, personal and therefore complicated. At some point in time my collection will be dispersed along with their memories. I will no longer have control over what happens to it. In relation to contemporary practices, I ask: “Where will this collection or work of art eventually reside and what (if any) is its value?” This question addresses the personal worth of the materials I collect and use in my practice and their relevance in relation to and referencing the escalating price of work so prevalent in today’s art market. ‘All Bound Up’ explores the intricacies of queer online intimacy. As app-facilitated/digital intimacies have become increasingly common, a dissonance between how bodies reveal, conceal, and interact has emerged on and off apps. In this exhibition, representations of app-facilitated intimacies become knotted bedsheets and anonymous portraits.